Smart speakers such as the HomePod have helped almost double the global shipments of the product category in the fourth quarter of 2018, but while Apple's speaker is seeing increased sales, it is seemingly falling behind its rivals in terms of overall market share. The holiday shopping period saw a considerable growth in sales for smart speakers, with Amazon's Echo range, Google's Home family, and Apple's HomePod benefiting from the category's popularity. According to a research report from Strategy Analytics, shipments in the fourth quarter for the market as a whole grew to 38.5 million units, an increase of 95 percent on figures from last year. This is said to be more than the total shipments across the entirety of 2017, and brings the 2018 shipment total to 86.2 million units. The big winners appear to be both Google and Amazon, rather than Apple. While the HomePod did see growth of 45 percent on a quarter-on-quarter basis, it is noted that the speaker's market share dropped from 4.9 percent in the third quarter to 4.1 percent in the fourth. By contrast, Amazon saw its shipments of Echo devices grow 91 percent in sequential quarters, growing its market share from 31.8 percent to 35.5 percent. Google follows in second place with a 30 percent market share, again an improvement on the previous quarter, but with its 11.5 million shipments representing 123 percent growth over Q3 shipments. "Smart speakers and smart displays were once again the most sought-after tech products this past holiday season," said director David Watkins. "We estimate that more than 60 million households worldwide now own at least one device." According to the report, Apple also lags behind a number of other tech giants in the market, including Alibaba, Baidu, and Xiaomi, with the latter notably seeing both market share and shipments slightly contracting on the previous quarter, but not enough for Apple to improve its ranking. 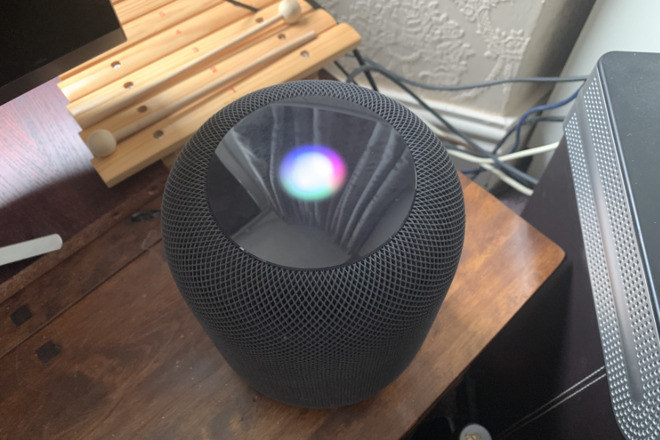 While Strategy Analytics' figures relate to global shipments, it seems Apple is faring better in the United States, with CIRP claiming in early February HomePod occupies 6 percent of the entire U.S. smart speaker install base as of the end of 2018. Even so, Amazon and Google continue to be far in the lead in the market, with shares of 70 percent and 24 percent respectively. Apple is working to provide the HomePod in more countries, with China and Hong Kong added to the list in January. While wider availability will be beneficial, it won't help the high-end and premium-priced HomePod take on the cheaper end of the market, which is dominated by the Amazon Echo Dot and the Google Home Mini. Frankly, I’m amazed that >30m units of this voice assistant speakers can even be sold. I wonder what the retention is, ie, how people use them actively versus them being put in storage or lying dormant, unused. Not bad considering the competition gives them away for free or 20 bucks. The sad part is that Apple is being compared to them when Apple never intended to compete with them. What Apple could do is release a gen 2, drop the price of gen 1 $100 and then surprise us with a portable version. There's already crappy portable speakers copying the HomePod design. I expect that they are like me and have 2 or 3 around the house. That’s something very expensive to do with a HomePod despite many holiday sales for as low as $250. Siri is too crappy as an assistant and the HomePod is too limited as a Speaker. Ironic that it turns out as a failure like Apples last attempt at speakers. Not that this is the end of HP because they could make it better by making Siri better. If gen 2 has an auxiliary audio port and USB connection then it could be much more compelling as a speaker. LOL...the "lead" to nowhere. This is a market where very little info is released on how often consumers use these devices or what they're used for. I can't speak for anyone else but I find I use mine more and more the longer I have it. As I add new home automation devices to my network, I use my Home Minis to operate them. I probably use them for music, searches, weather, lists etc as much as when I first got them. Aux is looking back, Apple needs to look forward. Another poster mentions them being expensive to litter around the house and that's a good point. Which is why a HomePod mini would make sense. Apple needs to go all in with Home. You’d think people would learn by now. It’s not about market share. It’s about quality, privacy, and installed base. Apple plays for the long term. Let see 38.5 million units sold. Think I’ll hold my Apple positions. That’s an argument to incredulity which is a logical fallacy. Nearly every family I know has one. The profits matter to some, the installed base to others. Those aren’t the percentages, they are units shipped in millions. There isn’t an argument of incredulity there, and I’m not sure what logical fallacy you are think I’m putting forth. I believe that there about 30m unit sales in 2018 Q4. Being amazed or wondering how many are in use isn’t denying that there are 30m units sold either. The numbers in active use could be 100% of units sold or 10% of units sold, it would be an interesting number to see. Your observations of your acquaintances using voice assistant box and extrapolating it out is a logical fallacy is it not? Agreed. They should include a pair of TRS and XLR interfaces to go out to a Subwoofer and Studio Monitors, just for kicks. The business graveyard is filled with companies and products that have chased market share over profits, hoping the the former with lead to the latter. Unfortunately it rarely works out that way. The only way it works is if it is not your primary business. This is problematic in that big companies come in and destroy the profitability of an industry by selling below cost to gain market share t sell their real product. This drives the real companies including the market founders out of business and once they are gone investment into impoving the space dries up because the replacement was never really passionate about it in the first place. They just wanted access. My home makes extensive use of automation (HomeKit obviously, not a single Google or Amazon device anywhere). I don't need HomePods in every room. Why? Because I have an Apple Watch and can use Siri to operate my devices. For people who don't have an AW you can also use your iPhone. However, since getting my AW I no longer carry my iPhone around the house like I used to. I have a large house and don't feel like installing over a dozen cheap "smart" speakers just so I can use HomeKit anywhere I want to. A single AW does that for me. The USA has about 80 million households. Even if the numbers sold in the USA was 10% of the 30m Q4 number, it would still translate to around 5 to 10m per year in the USA. It doesn’t take long for saturation to hit. I question how many households would really have them and what usage they may have. Heck, even home automation devices (smart locks, smart switches, smart control boxes), I have to wonder what the actual penetration in homes is. This stuff isn’t cheap. The penetration of CFL and LED lights isn’t all that great either, and that’s the easiest replacement process possible. I have a smart speaker in every room in my house except one. I have two in my Living Room. I love them, they're cheap and they're fun to use. Just the other night we're planning a driving trip to Florida. We were discussing different stops we could make and we asked Google the drive time from place to place. Yes, I could've used my phone, but then I'm looking at that and not my family. Speakers are more inclusive. You guys are assuming that every one of the Amazon devices is a $20 (occasionally on sale) echo dot. That would be incorrect since the units shipped also include the more expensive echo units. A current echo dot sells for $49 so you're way off just assuming all dots. Nice try.